If the people at Fusion had a hobby collecting state stamps, the book would be filled. 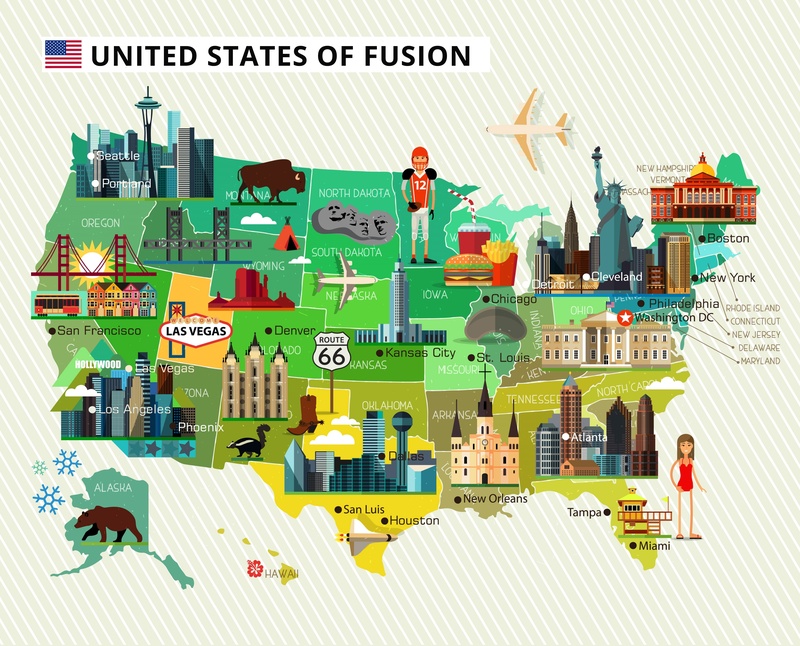 It’s no secret that Fusion travelers have an eye for wanderlust—and while you don’t need a passport to experience all 50 states, Fusion has left their mark on all of them. It’s not just about boasting Fusion’s 50-state pride. When you get down to it, Fusion is all about providing a truly unencumbered work-life balance, giving travelers the understanding that a full, rewarding life comes from the opportunity to explore new places, while doing their best work, wherever they are. Fusion travelers have a passion for seeking new experiences. In a recent study, nearly 53% said their favorite thing about their job is the ability to explore new places. Plus, an overwhelming 76% enjoy sightseeing and exploring their new environment, preferring the states of California, Arizona, Colorado, Oregon and Washington. Fusion travelers also favor the weather and scenery of their new locations and participate in outdoor activities, like hiking, camping, fishing, bicycling and swimming. Not everyone is an outdoor adventurer, but there’s still plenty to do. Over half (58%) of Fusion travelers said they enjoy trying new restaurants in their new location and nearly 16% enjoy cooking. Other activities, such as photography and movies also made the list. Fusion travelers are also great at making friends and meeting new people in the industry. In fact, they have said that the best thing about their job is the ability to travel and meet new professional connections, and 35% enjoy spending time with friends. 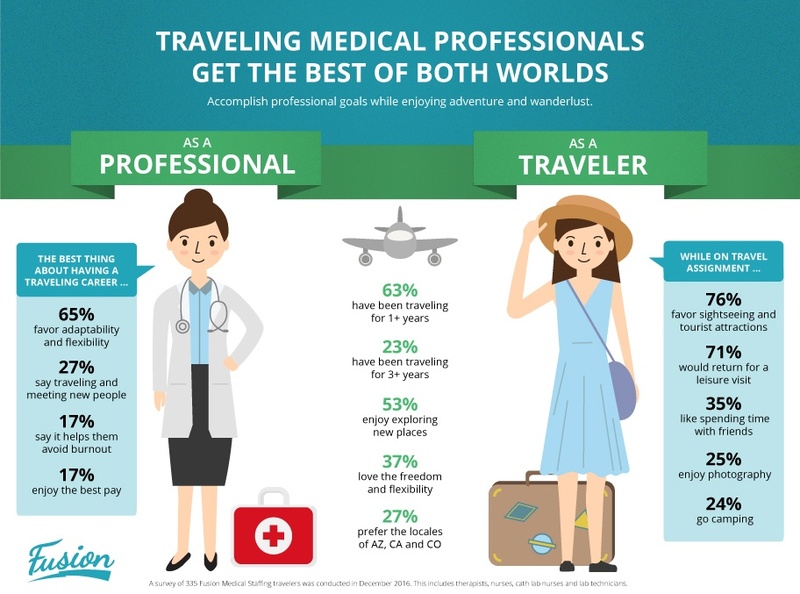 Additionally, nearly 37% said they favor the freedom and flexibility that comes with being a traveling medical professional. It’s not difficult to see that working as a traveling medical professional comes with some pretty great benefits. The ability to discover new places allows Fusion travelers to learn new things about themselves too. Because they are faced with new situations every day, they develop skills that will be beneficial to them professionally and personally. Fusion travelers know that when you live your best life, you can show up every day, being your best self. They truly enjoy the best of both worlds, making it a happy work-life balance. *Disclaimer: A survey of 335 Fusion Medical Staffing travelers was conducted in December 2016. This includes therapists, nurses, cath lab nurses and lab professionals. We are here to answer any questions about travel or Fusion!